Like most things, preparation is important. 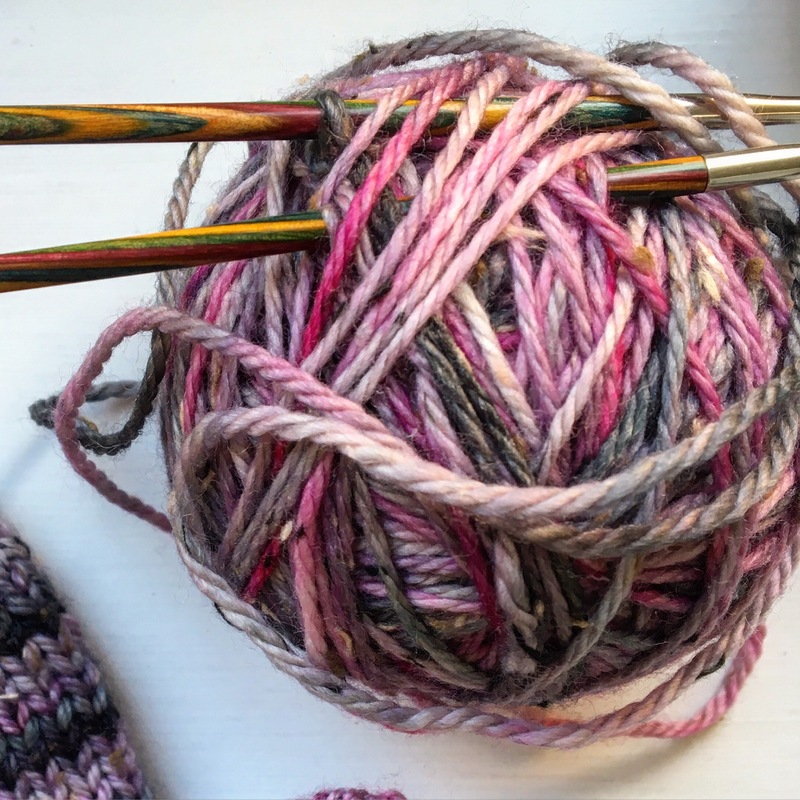 You need to thoroughly soak your yarn and get set up before you start. It’s really quite stingy when you splash the citric acid soak in your eye, so you will probably want to avoid doing this by either being careful when you get your yarn out of the bucket or if, like me, you are prone to clumsiness, by wearing goggles (I have onion peeling goggles which would have been excellent for this, had I been forewarned). A little bit of dye goes a loooonnnnng way. All over spoons, jars, tables, clothes, small children. You need to be prepared to make a mess, so take precautions. I wore old clothes and an apron, and I had plenty of kitchen towel on hand to mop up spills and wipe up between different colours. And if you are hand painting on super wash yarn, boy, does a lot of water go everywhere. I’m thinking old towels would have also be useful if I’d had some. Wear gloves. And don’t get distracted by small children (“Mummy, I did a poo poo”), remove your gloves to attend to them, and then forget to put then back on again. Unless you want to walk around with multicoloured hands and nails for the next several days. If you are at all worried about your yarn felting then cold dip dye or hand paint your yarn (this is what I did), rather than kettle dye. Having super wash in your yarn will help but remember you need heat AND agitation to felt yarn so, as long as you don’t fuss about with it too much when it’s hot (you won’t be able to touch it for ages anyway after it comes out of the microwave), you’ll be fine. It will seem like the skeins take a small eternity to dry. It rained both days I did my dyeing and waiting for skeins to dry indoors is just so dull, so, if you can, dye on a dry day and hang them outside on the line, they’ll dry in no time. 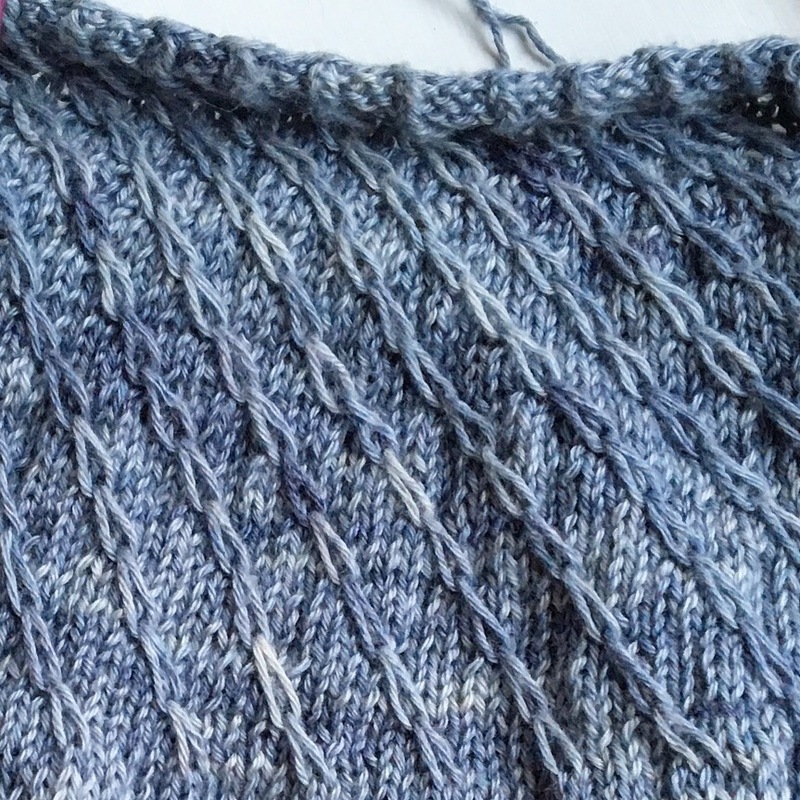 Try not to have too many preconceived ideas about what you want the yarn to look like at the end. I just went with the flow with the tone of my first few skeins. It turns out that I’m pretty heavy handed with the dye so get strong colours, but, because I’m using them together, I wanted my skeins to tone which meant the same strength of colour throughout, so, I had to work harder with the last few to make sure I was getting that right. That’s ok because I mostly enjoy a challenge but if you aren’t so keen, go easy on yourself and don’t stress about it. Like any new craft it takes plenty of practice to learn how to produce the effect you want. Whatever you make, it will be fabulous. Your skein will probably appear to get in a hideous tangle but do NOT be tempted to untie the ties to sort it out. That way lies madness and many hours of (not so) patient untangling. Once it is dry, just go around each of the ties in turn and check that there are no threads lying over the tie. Once you are satisfied that’s the case, pop your hands in either end of the skein and give it some sharp tugs as if you were trying to stretch it out. Then you should be good to pop it on a swift or a handy pair of outstretched arms, cut your ties and ball away without tangles. 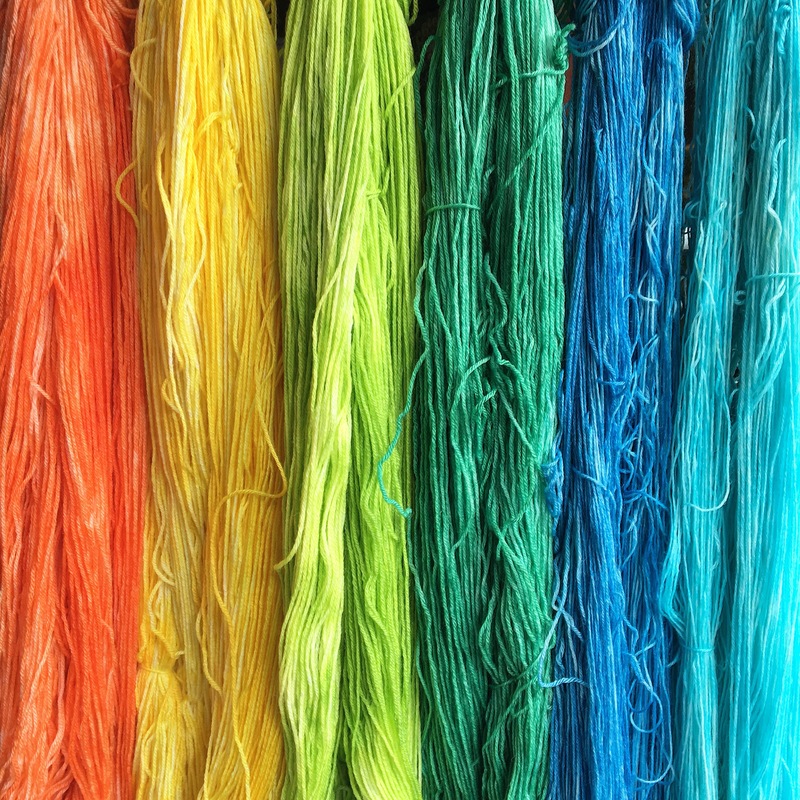 Be prepared to dye more yarn than you actually need. You will love your creations so much it will be hard to ball them up and use them. You will want to keep them as yarn pets for ever, just for squishing. It’s worth getting a note book and writing down what colours you mixed. You think you’ll remember because you had such a fun time but, in reality, busy lives crowd in and you won’t. I’m only a few days away from having finished dyeing the yarn for my blanket and I’m already starting to forget. Besides, its always good to have an excuse for a new note book. As soon as you finish, you will want to dye more, and it will be a fidgety torture waiting for the postie to deliver more yarn. So get in more undyed yarn than you think you are going to use. I guarantee you will use it all. So, the long awaited dye has actually arrived, and I have been busy in my kitchen. 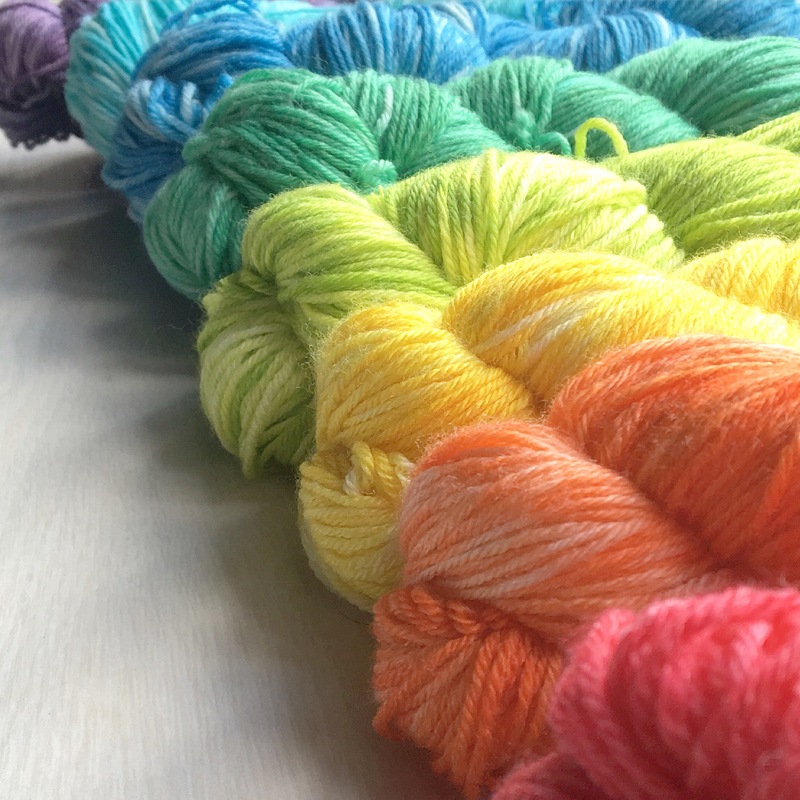 Last year I went on a yarny retreat in Lyme Regis, run and hosted by the very lovely Daisy from Devon Sun Yarns (if you need reminding, I wrote about it here) and, over that weekend, I learnt to dye yarn. I’ve had a couple more tries since then on other retreats and workshops, all under Daisy’s supervision. But I hadn’t actually done any yarn dyeing on my own, so when the idea for a temperature blanket required justification, dyeing my own colours for it seemed the way to go. Daisy supplies excellent yarn dyeing kits (with detailed instructions for those who haven’t had the benefit of her presence) with no nasty chemicals so they are safe to use in your kitchen. But, sensing I probably needed a bit more of a challenge, and because I wanted to dye a blanket’s worth of yarn, Daisy supplied the undyed yarn and pointed me towards procian dyes. The process for dyeing with procian dyes is exactly the same as dyeing with the dyes in Daisy’s kits, but with procian you need separate pots, pans, spoons etc as they aren’t food safe so you can’t use the pans etc in your cooking afterwards. This type of dyeing is known as acid dyeing, which, when I first heard the term, brought to my mind memories of lab coats, goggles and bubbling beakers of hydrochloride acid and those cupboards with the big extractors in the chemistry lab at school. But we aren’t talking about scary acidic, just a bit of an gentle acidic soak for the yarn before applying the dye. Because I was dyeing a animal fibre yarn, I made my acidic solution by adding citric acid to some water in a bucket. Luckily I had some citric acid in the cupboard, left over from some random long forgotten cooking experiment. If you don’t have any, I’d recommend you get some just for the comedy value of the faces your children will make after slyly eating some thinking it is sugar. Alas this isn’t something that is going to happen much longer as they are now learning to read and the jar has a big label so I don’t get confused (I have previously tried to make marzipan from cornflour rather than icing sugar so all my jars now have big labels). So, citric acid for animal fibre. If you wanted to dye plant fibre (like cotton), you’ll need soda ash in your soak. I left my yarn to soak overnight but I’m suspecting that just a 30 minute soak would do it. You want to make sure the acid solution properly gets right into the fibre, so squeeze out the big air bubbles when you put your yarn into soak. I’d already decided which colours I wanted (see the post here) so I got to mixing the dye. I decided to start with my orange, yellow and greens, because, well, you have to start somewhere. The dye comes in powder form and you just mix it with tap water adding more water or more dye, mixing until you achieve the colour you want. I made one colour at a time and put away the dye in between so as to avoid accidents (I am outrageously clumsy). I wanted a fairly solid colour for my blanket and the obvious way to achieve this is kettle dyeing. But, despite scouring local charity shops I couldn’t get hold of an old saucepan (unless they are in mint condition, the charity shops just bin them). Ideally I’d use a maslin pan but didn’t want to use the perfectly good one I have in the cupboard as (because I am using procian) I wouldn’t be able to use it afterwards to make strawberry jam, and strawberry season will soon be upon us. So I went with hand painting. To protect my kitchen table oilcloth I put down one of those toddler dry nites sheet things you use to save the mattress from nighttime accidents, when potty training children. Then I put down a couple of sheets of cling film, wrung out and laid on the skein of yarn, spreading it out well. Then I added my colour. I used a paint brush (the sort you use on walls) to paint on the colour and a spoon to dribble it on. It was fascinating to see how the yarn sucked up the colour leaving just a little water behind. Then once I’d put on all the colour I wanted (and I deliberately left some parts lighter so it would look unmistakably hand dyed), I wrapped up the skein in the cling film, laid it in a glass dish and popped it in the microwave and fixed the dye by cooking it for 3 minutes, then resting for 3 minutes, then cooking again for 3 minutes. This was probably overkill but I didn’t want all my dye to run out, given it was my first time. Once the yarn had finally cooled down (and it does come out of the microwave at approximately the same temperature as lava) I gave it a quick rinse and hung it up to dry. I do like to visit independent yarn stores so while I was staying my in-laws recently I asked on a couple of Facebook groups if anyone knew of any good ones nearby and Stitch Solihull came up, so on a rather rainy Sunday, I paid a visit. Stitch Solihull was opened just three years ago by Ana, who told me she had no previous experience running a yarn store, so what she has created is all the more impressive. It’s a gloriously colourful space with a fabulous welcoming sofa generously adorned with cushions and crochet blankets, and the biggest Heidi Bears’ Dinosaur if have ever seen (Ana made him in aran). Ana has also made a more normal size Heidi Bears’ Hippo. Isn’t he fabulous! Now, I do like a yarn shop (well, any shop really) with a big comfy sofa and if I hadn’t been accompanied by my husband and children (who refused to play outside in the rain) I might have lingered there, knitting in hand. But there was an extensive range of yarn to be squished, including a favourite of mine, Fyberspates Scrumptious, a merino/silk 4 ply in gorgeous colours with a particularly lovely twist, and Noro, which I’d always thought was a bit rough and scratchy until a friend of mine filled me in on how soft it became after washing. 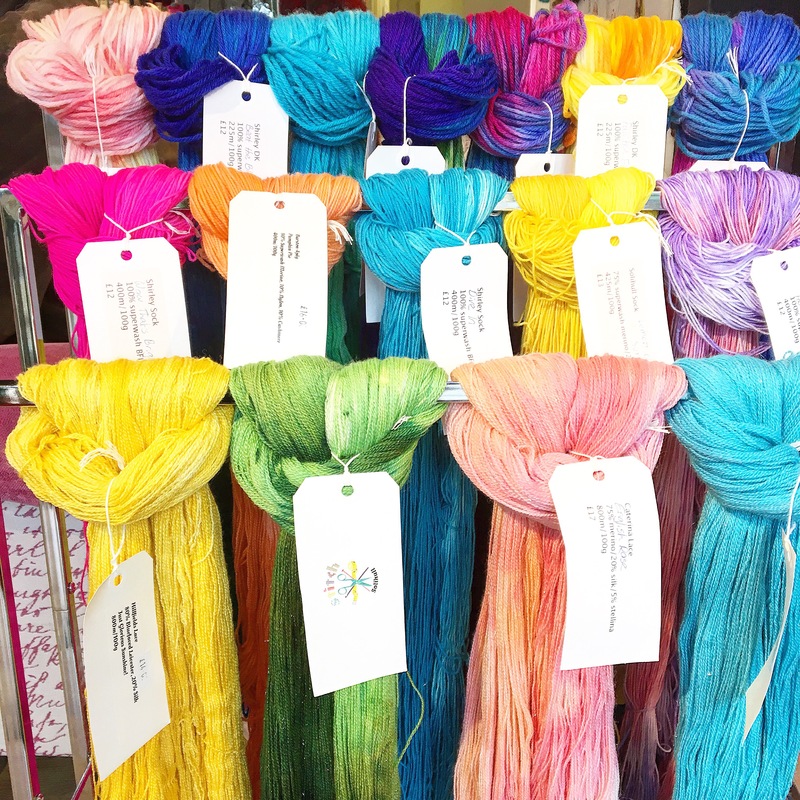 Ana also stocks a range of hand dyed yarns, as well as undyed yarns and can arrange to have yarn hand dyed to order. It’s always interesting to see what the owner has on his or her needles and Ana did not disappoint. She had not long cast on a pretty shawl in a lovely yarn from Juniper Moon Farm. But it’s not just yarn. Ana stocks gorgeous fabrics, an extensive collection of buttons, needles, hooks, kits, thread and wool wash. And, Ana is the owner of the most impressive wool winder I have ever seen. Now, wool winders aren’t usually terribly attractive things, don’t take a good photograph, so consequently would not normally be a subject of my blog, but, just check out this big boy! So, eventually, with my children getting restless, I signed up to the news letter, made my purchases and made a mental note to return. You can find Stitch Solihull in a ‘cabin’ in the outside plant section of Notcutts Garden Centre just off junction 4 of the M42 and if you are ever passing, and need an excuse to break your journey, it’s well worth popping in. Erm. Yes, I know what you are thinking. You know those words are English but, what am I on about??? Well, after a couple of years knitting socks and shawls and hats and clothes for the kids, I’ve finally summoned the courage to knit a garment for myself. Courage was required because a garment is a big undertaking, it’s a lot of knitting, and it’s got to fit (unlike the kids clothes when you can just knit a size up knowing they’ll grow into it eventually). Getting a garment to fit requires two things. A tape measure and a tension square. The tape measure is for measuring oneself. Alas knitting patterns rarely come in standard sizes 8, 10, 12 etc. Rather, they give various measurements for each size and you have to pick the one that best meets your own measurements. But it was a surprise to me to learn I am not the size I imagined I was. In fact, I am several inches bigger than the size my bra would have me believe (and now I actually understand all those numbers and letters!). My measurements taken and duly noted, I compared these with the pattern I had selected (the Heliotropic Pullover by Mercedes Tarasovich, chosen because I thought it would be versatile, with ot without another top underneath dependant on the seasons. And also, I only had 300g of the yarn I wanted to use so I was never going to be able to make something with sleeves). And here is where the confusion starts. The pattern says the smallest size of the finished garment is 45 1/2 inches bust measurement. Now my bust is nowhere near this, so I read on. It turns out that this is the finished size at the hem not the bust. Eh? The design of the pattern makes it a ‘functionally smaller garment at the bust’ so the smallest size is for a 37″ bust. I’m a bit bigger than this but nearer to the smaller size than the next size up, so I opted for the smaller size, because of positive ease. So what is this positive ease I speak of? Positive ease is simply where the garment is designed to be a bit bigger than the wearers measurements (compare this with negative ease on socks where the sock is narrower than the foot so it doesn’t go all saggy and fall down with wear). The pattern in question talked of several inches of positive ease, so I went with the smaller size. Next up is the tension square. Many knitters I know have never made a tension square. 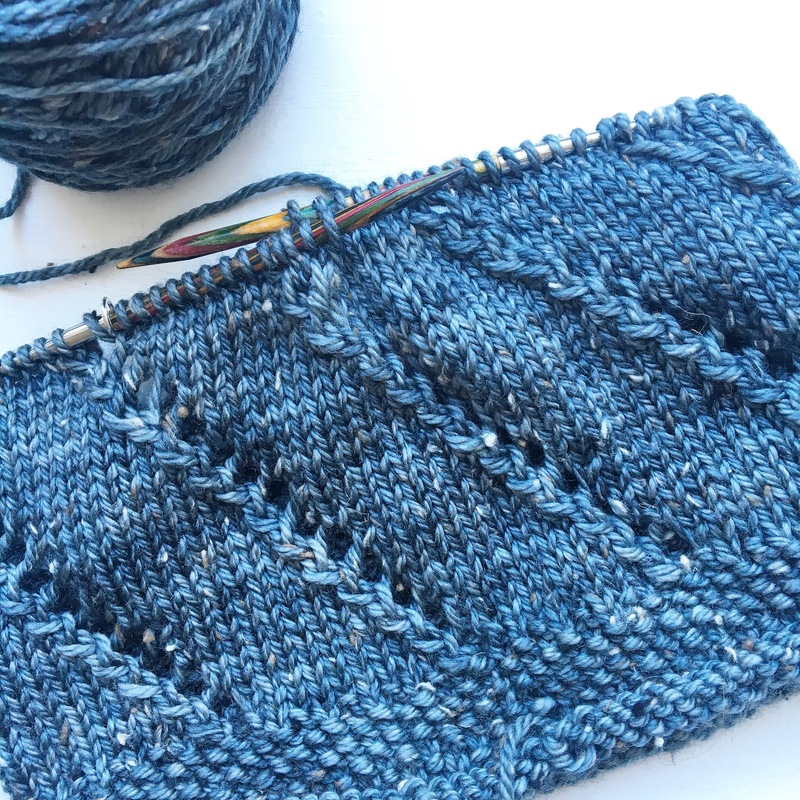 And I don’t often, but given my dilemma over pattern sizing and the sheer amount of knitting involved in the finished garment, it seemed prudent. For the uninitiated, a tension square is just a small knitted square made on the suggested needles and with the yarn of your choice (in my case a really rather scrummy yak from the January Yarn Club by Daisy at Devon Sun Yarns. Gorgeous to knit with, cotton like in feel but warm like wool), to check your gauge against the designers. The theory goes, if your tension square is too small, you go up a needle size and knit another square to check again, repeating the process until you get the correct gauge. You go down a needle size if your square is too big. Well, the goldilocks effect reigned supreme because my tension was just right. But. Even though I’d gone through all this preparation, all the way through the knitting, I still doubted it would actually fit (and I cannot tell you the dispair that filled my heart when I read the words, “Continue in stocking stitch for the next 14 1/2 inches”. It was a lot of knitting!). You see, I wasn’t really reassured by the potential positive ease because on the circular needle, it looked really quite small. And, even worse, everyone who saw it in progress, quietly thought the same thing (I could see it in their faces; they would only confirm their thoughts when I shared my own fears). So, it was with some nervousness that, after the final cast off, I tried it on and, hurrah! It fitted, if not exactly like a dream, certainly like a dream with some positive ease. And, as first knitted garments go, I’m pretty pleased with it. These words, uttered by my 5 year old daughter in a tone of incredulity recently, upon the sight of me knitting (again! ), made everyone one else in the room laugh heartily, but made me fly into a panic. “Nothing” I said as I hastily shoved my knitting away in a bag out of sight. But she eyed me suspiciously and I suspect the game is up. The game, which, until now, I have played regularly with both my children, is informally called “did you buy it in a shop?”. You see, despite being lovingly clothed from an early age in fabulous handmade knitwear and fed nutritious (ahem!) home made biscuits and gingerbread men, my children are astonishingly keen to eschew all home made items. No, I don’t understand it either. If I hadn’t been there and actively participating on the night of their birth, I would seriously question whether they were actually my children. Their favourite snack is any biscuit out of a packet. Any biscuit. Just so long as it has been previously packaged. The packet, it turns out, is of the upmost importance, signifying shop bought rather than made by their mother’s fair hand. If I answer “yes” to the question “are they from a packet?” I am greeted with yippees of delight. If I answer “no”, I get a sullen “oh” and they take the biscuit as if it were something I might have otherwise offered to the dog. It’s worth me pointing out at this point that I am no slouch in the home made biscuit department so it’s not because they are of lesser quality than the shop bought biscuit (anything but!). They simply lack a packet. The same is also true of their clothes. If a cardboard box with the word Boden on the side, is delivered to our house, the children open it with squeals of delight, hastily trying on everything and wearing it (often all of it, no matter how many tops are in there) for the rest of the day. But try getting them to wear a home made garment? Not a chance; if you can persuade them to try it on (just for a photo, so mummy can put it on her blog, please?? ), within 30 seconds they are complaining it is too hot, too tickly or too itchy, despite no part of their bare skin actually touching the item. So the item is removed, parked in a drawer and barely looked at again, except with suspicion. However, if they don’t see it being made, and I have a handy bag available I can produce it with a fanfare and a big tah-dah! and they’ll love it and wear it forever. Yes, I know it’s a lot of effort to go to but, well, it’s either that, or not knit, and that’s just ridiculous. So, you see, it is quite important in order to maintain the ruse, that they don’t see me actually making the garment. Consequently, after my daughter’s question, I’ve been struggling with what to do. 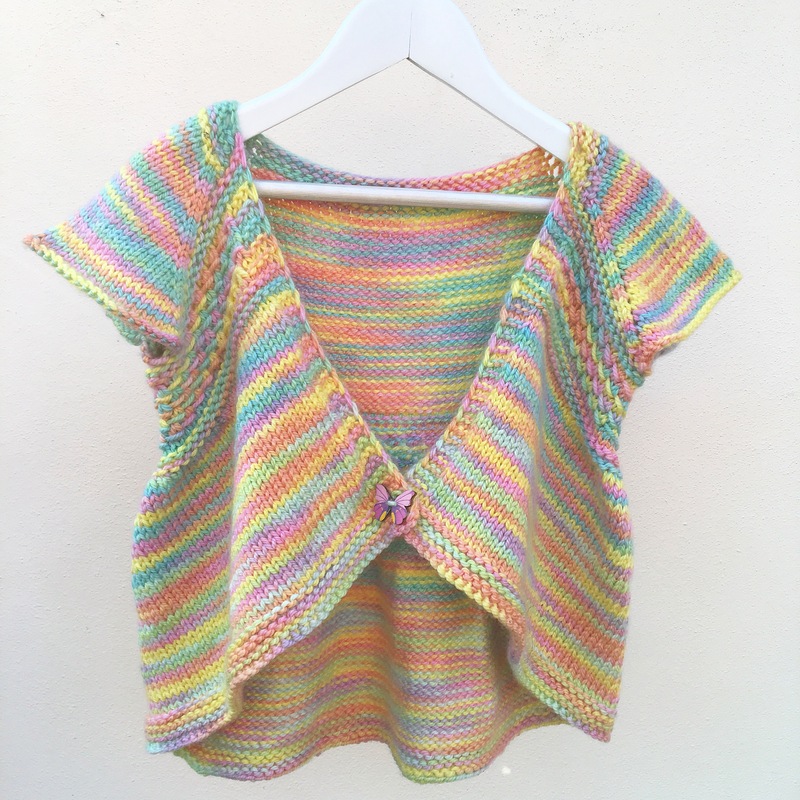 The item in question is a sweet cardigan called Entrechat by Lisa Chemery made from a gorgeous aran weight yarn hand dyed by Daisy from Devon Sun Yarns. I don’t want to pretend I bought it in a shop. Especially if there is any chance my daughter will recognise it and realise I’ve been hood winking them all this time. But I don’t want her to refuse to wear it either. So I’ve been dithering over what to do. As is often said (although perhaps not by many people parenting young twins), honesty is the best policy; not least because, one day quite soon, they will be able to read this. So, honesty it is. Here is the finished cardi. It maybe the last time it sees the light of day for a long time. But, I’ll let you know how we get on. Darning. How it came to this. Like a lot of people, I knitted when I was a child, and, maybe slightly more unusually, I continued well into my twenties, but, the closure of our local yarn store when the proprietress retired and with the cost of good quality yarn being beyond my, then, meagre resources (and I really couldn’t be persuaded to make any more garments from acrylic), I gradually stopped knitting. That’s not to say I stopped crafting. But I did stop knitting. Or at least knitting regularly. Then after ages and ages, two things happened. The first was that I had my children. For the benefit of those readers who haven’t had a peek at my “about me” page, I have 5 year old twins, a boy and a girl, and I was (and remain) astonished at how exhausting parenting is. For a period of about 6 months, in order to cope with my 4am starts, I would fall asleep on the couch by eight o’clock each evening. And so, it was in an effort to stay awake (and remember who my husband was) that I came to the conclusion if I was doing something with my hands, it would be harder for me to nod off in the evenings. So I bought some yarn and patterns, and picked up some needles and started knitting. I made a cardi for my daughter and a couple of sleeveless pullovers for my little boy and was generally pretty pleased with them. Then the second thing happened; my very good school friend Gail taught herself to crochet. I loved the things she was making and, I was missing yarn, so she set me up with a crochet hook and got me started on granny squares. For the whole of that Autumn and Winter, I made blankets. I made them with such a fervour, my husband started to fear for my sanity. We soon had more blankets than beds but I couldn’t stop. I started blanket after blanket. Bought yarn pack after yarn pack. Joined Facebook group after Facebook group. And then I discovered hand dyed yarn. And so I did. A mini obsession was born. I made lots and lots of socks and was supremely happy with every pair. But that was a while ago now and it’s funny how these mini obsessions go in cycles. The sock phase was superseded by a shawl phase (as these are also often knitted with sock weight yarn) which, in turn, was superseded by my recent, and still continuing, hat phase. I mention this now because, yesterday, I noticed that my most favourite watermelon socks (pictured above), made from fabulous hand dyed yarn from Abi Grasso, have a hole in the sole. Whilst I’ve done some other forms of mending, I have never darned anything and will admit to feel a bit daunted by the prospect. So, if you need me, I’ll be watching sock darning videos over on YouTube and wondering whether to invest in a darning mushroom. Dyeing with onion skins - Workspace - Sheep Farming: the Stratified system - ‘I can’t wear wool, I can only wear merino” - Unravel 2019 - Don’t even think about getting your workout wardrobe in shape - Woah for woad - Jacob Wool and my Brazen base - WOVEMBER - Drowning In Plastic - Let’s talk about Silk - Me Made May Martin - World Wide Knit In Public Day - Sock kits - Natural plant dyeing - Flockfest goodies - Flockfest, here I come! - March and April makes - Flockfest - Shop Opening - Edinburgh Yarn Festival 2018 Part 2 - Edinburgh Yarn Festival 2018 - February 2018 Makes - January 2018 Makes - My Unravel 2018 - Resolutions 2018 - Knitting monogamy - Luscious Loop - Finishing All The Things - Love it Hate it Love it - Border design - Cuddlebums 2015 Shades Blanket Club finally finished - Starting the finishing - New year, new... concept of completed? - YARNDALE 2016 - It's been a while - Bridport Yarn - Crafting on the move - Oh I wish I was a punk rocker with flowers in my hair - Dyeing: things I learned - Dye Day - Stitch Solihull - Heliotropic positive ease in yak - Where is my dye? - What are you making NOW? - A little bit about me - Trip to Toft - Egg-gate - Darning. How it came to this. - Postie Stalking - Right. Let's. Get. Started.